Lime Complex is a mineral vitamin supplement. the blood. The added Vitamin C plays a role in the production / construction of cartilage, for the maintenance of healthy cartilage and for the maintenance of strong bones. In connection with the new legislation that came into effect on December 14, 2012, the product description of this product has been adjusted. We unfortunately can not tell you everything about this beautiful product. You can request additional information about this product by filling in your e-mail address. When you log into the site with your username and password, you will also find more information. Osteoporosis or bone decalcification is becoming a bigger problem. At the moment, one in three women and one in eight men aged over 55 will experience it. It is estimated that more than 800,000 people in the Netherlands have osteoporosis. The expectation is that these numbers will increase in the coming years. Not only because of the aging of our country, but also because of the increasing number of young people who are affected by this condition. In young people this is due to a wrong diet at a young age. In osteoporosis, the bones become so weak that they can only break. The most common fractures are wrist, hip and vertebral fractures. Every year, more than 83,000 people break a bone as a result of bone loss. A lot can be done to prevent osteoporosis, but then you have to be there on time. Research shows, however, that in most cases osteoporosis is only discovered when something breaks. So it is best to take preventive action. Bone is living tissue. It is constantly being built up and broken down throughout your life. Until the thirtieth year, the build-up is greater than the breakdown, which makes the bone firmer and grows. After the 35th year, the degradation gradually becomes greater than the build-up, so that the bones become less firm. This in itself is not such a problem as the maximum bone mass is built up and there are therefore healthy solid bones. However, there are groups of people whose bone mass is broken down faster, so they have a greater chance of osteoporosis. • Women who have osteoporosis in the family. • Women who are already in transition in their 45th year. • Women in whom the uterus and / or ovaries have been removed. • Persons who have had an eating disorder. • Persons with a disorder in the hormone system. • People who do little physical activity or are bedridden. • Persons with a chronic bowel disease. • Persons who smoke and / or drink heavily. to produce bone formation, more substances are needed. That is why Kalk Complex not only contains calcium and magnesium, but also vitamins C and D. The added minerals (copper, zinc, manganese and selenium) also play a role in building healthy bone tissue. 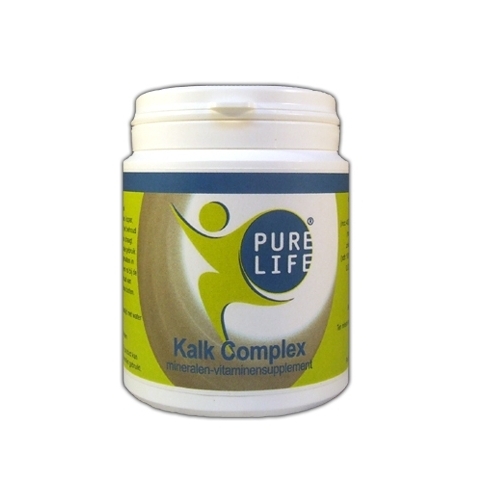 An additional advantage of the Kalk Complex is that the tablets do not contain lactose. The following overview can give you an idea of ​​what substances your body receives when using Kalk Complex and what they do in the body. The combination of these substances in Kalk Complex make this product a very special joint formula. The mineral calcium (lime) gives firmness to the skeleton and teeth. Calcium is also necessary for the proper functioning of the muscles and for guiding stimuli to the nerves. Calcium is also involved in blood clotting, cell growth and hormone metabolism. Vitamin C (ascorbic acid), a water-soluble, is primarily important for good resistance. In addition, it ensures healthy bones, teeth and blood vessels. Vitamin C is also an antioxidant and protects the body together with vitamin E against free radicals. Free radicals play a role in aging processes. Vitamin C also promotes the absorption of iron. Vitamin D, a fat-soluble vitamin, is important for strong bones and teeth and promotes the absorption of the minerals calcium and phosphorus in the body. Vitamin D also plays a role in the maintenance of the resistance and in the proper functioning of the muscles. The most important source of vitamin D is the sunlight. Vitamin D is produced in the skin under the influence of sunlight. Manganese is necessary for the formation of bone tissue. Furthermore, manganese is involved in the metabolism of amino acids, cholesterol and carbohydrates. Copper ensures that iron is captured in hemoglobin, the red dye in our blood, and therefore plays a role in the oxygen transport in the body. Copper is also involved in the pigmentation of skin and hair and in connective tissue and bone formation. Manganese is necessary for the formation of bone tissue. Furthermore, manganese is involved in the metabolism of amino acids, cholesterol and carbohydrates. Zinc is necessary for the development of proteins and thus for the growth and renewal of tissue. In addition, it plays a role in the build-up and breakdown of carbohydrates. Zinc is part of the hormone insulin and it ensures that the immune system works well. This is a dietary supplement. Ingredients per recommended daily dose (= 4 tablets): calcium carbonate natural 668 mg (adh 83%), filler (mcc 400 mg), vitamin C 84 mg (adh 105%), anti-caking agent (magnesium oxide 100 mg and magnesium stearate 24 mg), zinc citrate 4 mg (adh 40%), vitamin D3 cws (200IE) 2 mg (adh 100%), manganese citrate 0.704 mg (adh 35%), copper citrate 0.02 mg and selenium methionine 0.5% 0.02 mg (adh 36%) (= 52% of the total content provides lime). 4 times daily 1 tablet with water during a meal. Keep dark at room temperature. Keep out of reach of young children. This product can not be used as a substitute for varied food. Due to the ever increasing pressure that people face today, inner turmoil often arises. The Magnesium capsules contain 2 types of organic magnesium including citrate and oxide, which improves the absorption. This product is suitable for persons who require a magnesium supplement every day. In connection with the new legislation that came into effect on December 14, 2012, the product description of this product must be adapted. Unfortunately we can not tell you all about this beautiful product and are working on a new foundation to provide you with the necessary information. magnesium citrate 512 mg and magnesium oxide 241 mg, adh magnesium total 53% and fillers (Mcc, magnesium stearate and colloidal silicon dioxide) 16 mg.
3 times daily 1 capsule with water. Magnesium Citrate is a mineral supplement. Magnesium has a number of functions. In this way it contributes to the reduction of fatigue and fatigue, helps to ensure the proper functioning of the nervous system and a normal psychological function (contributes to brain and nerve functions involved in learning ability). Moreover, it contributes to a normal functioning of the muscles. It also promotes energy metabolism. Magnesium is available in two forms. The liquid citrate form is quickly absorbed by the body, allowing you to use it at the time you think it is necessary. The Magnesium capsules contain 2 types of magnesium, citrate and oxide, which improves the absorption. This product is suitable for persons who need a magnesium supplement every day. Under the tab 'Additional info' you can find any allergens and use advice. This is a dietary supplement. Ingredients per daily dose of 20 ml: 144 mg Magnesium (38% RDA) as quickly absorbable magnesium citrate. Ingredients declaration: filler (purified water), acidity regulator (citric acid and magnesium hydroxy carbonate) and preservative (potassium sorbate). Plastic bottle with screw cap and dropper. Maintenance dose: 1 time daily 1 measuring cap from 10 to 20 ml in the morning half an hour before the meal. Possibly with lukewarm water. Use in acute situations: 1 measure cap of 20 to 40 ml half an hour before a meal. Possibly with lukewarm water. Take as long as the need is there. Shake before use. Keep dark at room temperature. A healthy lifestyle is important, as is a varied, balanced diet, for which nutritional supplements are no substitute. Questions come in about the "sediment" that you find at the bottom of the bottle. The reason is that we work with a so-called saturated solution of magnesium. This means that there is actually more magnesium in it than the liquid can dissolve and that too much settles on the bottom of the vial. By shaking you dissolve the extra that is in it. Because of that "too much" you are always assured of an optimal dose of elemental magnesium. Aloe Vera juice is a mineral supplement. Aloe Vera juice is a mineral rich drink that is good for a balanced intestinal flora. In addition, Aloe Vera juice stimulates bowel function. The organic minerals present promote the metabolism. 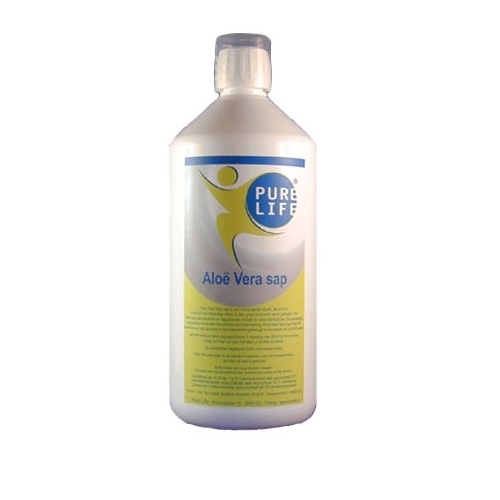 Aloe Vera juice helps to strengthen the intestinal flora, to build up and to promote a natural bowel movement. This is a dietary supplement. (citric acid monohydrate), preservative (potassium sorbate) and sodium benzoate. Plastic bottle with sealed screw cap. 1 measuring cap of 20 ml on an empty stomach half an hour before eating or drinking. Adapt to personal needs in acute situations. Keep dark at room temperature and keep closed in the refrigerator after opening. Not to be used in the first 3 months of pregnancy and during lactation (if not already used). Multivitamin minerals is a vitamin-mineral supplement. In a busy and active life, it may be that a well-balanced meal is lost. Multivitamin minerals are therefore a good addition to the daily vitamins and minerals. Vitamin B6, B12, and C, for example, contribute to the normal functioning of the immune system. Thiamine supports the energy level. Vitamin E contributes to the protection of cells against oxidative damage and against influences of pollution and sunlight. This is a dietary supplement. Ingredients per recommended daily dose (= 1 tablet): vitamin C (as L-ascorbic acid) 300 mg (adh 375%), dicalcium phosphate 110 mg (adh 13%), vitamin E (as d-alpha-tocopheryl acetate) 49 mg α- TE (408%), flour conditioner (cysteine ​​hcl) 66 mg, calc oyster shell 42 mg, potassium citrate 42 mg, magnesium oxide 42 mg (adh 11%), pantothenic acid 30 mg (vitamin B5 adh 500%), thiamine hcl 18 mg (vitamin B1 of 1636%), PABA 19 mg, pyridoxine hcl 15 mg (vitamin B6 adh 1071%), betaine hcl 13 mg, bioflavonoids lemon 10 mg, cartonoid compl. 6 mg, ginko biloba 5 mg, mouse thorn 5 mg, inositol 4 mg, riboflavin 3.1 mg (vitamin B2 adh 221%), niacin 3.0 mg NE (as nicotinamide) (vitamin B3 adh 18%), zinc citrate 2, 5 mg (adh 25%), iron (II) fumarate 1.34 mg (adh 9%), manganese citrate 0.80 mg (adh 40%), folic acid 60 μg (adh 30%), vitamin B12 (as cyanocobalamin) 16 μg (adh 640%), chromium picolinate 13 μg (adh 32%), biotin 5 μg (vitamin B8 adh 10%), kelp 0.003 mg and selenium methionine 20 μg (adh 36%). Take 1 to 3 tablets daily with water before meals. Keep dark at room temperature. Keep out of reach of young children. A healthy lifestyle is important, as is a varied, balanced diet, for which nutritional supplements are no substitute. Vitamin C 1500 is a vitamin supplement. This Vitamin C is a very high dosed Vitamin C and therefore extra strong. It contributes to the normal functioning of the immune system and also ensures good resistance. Vitamin C also promotes resistance during and after physical exertion. Thus, it contributes to the normal collagen formation for the normal functioning of blood vessels, the bones, the cartilage, the gums, the teeth and the skin. Vitamin C activates your natural energy in the body. This is a dietary supplement. Ingredients per recommended daily dose (= 1 tablet): Vitamin C (as L-ascorbic acid) 1062 mg (adh 1327%), bioflavonoids 25 mg, roseships powder (rose hip) 20 mg, fillers (MCC 223 mg and croscamellose sodium 28 mg), anti-caking agents (silicon dioxide 10 mg and magnesium stearate 12 mg) and thickener (hypromellose 8 mg). Take 1 to 2 tablets daily with water before meals. Store in a dry place at room temperature.